Bernard Katz has been working with glass since 1986. He received his B.A. in Art from Temple University’s Tyler School of Art, majoring in fine Arts and specializing in Glassblowing and Sculpture. He also spent time studying abroad at the West Surrey College of Art in Farnham, England. 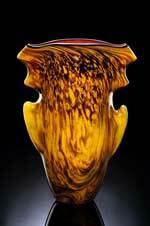 After graduation, Bernard began working around the country for several well known glass artists such as Leon Applebaum, David Garcia and Samuel Bloom before opening his own studio. 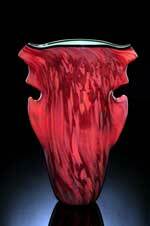 Katz has become particularly well known for his etched designs on handblown vessels which he also makes. His designs are all original and usually involve living subjects found in nature, especially trees. He begins by handblowing the glass vessel creating a 3-dimensional canvas of glass on to which he ultimately etches the final imagery. He designs and makes each piece himself. All the etching is done free form by hand making no two pieces the same. While this takes more time, the end result is far more impressive. His Tree Series and Root Series are pieces with brilliant transparent colors encased by layers of crystal. A darker layer of color is applied that is later etched away to reveal the image and underlying colors. Once the pieces has been annealed (cooled and solidified) the engraving or etching process begins. The entire piece is covered with high pressure tape on which he carves his designs with special blades. Specific areas are cut away one section at a time. Finally Katz uses fine grain sand at high pressure to remove layers of glass. This is a very tedious and somewhat risky process. One mistake can easily destroy the piece.